Winston Dookeran’s budget proposals to re-order the ongoing CL Financial bailout have sparked considerable controversy. Dookeran stated his first priority to be “…Stop the drift and indecision…” – ironically enough, it appears that the sentiments of the public are moving in another direction entirely. A new mood of protest and threats of impending lawsuits have emerged. This is a live example of the law of unintended consequences. Clearly, Dookeran took the decision to review the MoU of 30th January and the Shareholders’ Agreement of 12th June 2009. He reduced the burden on the State by increasing the sacrifice of those who were anticipating the return of all their funds under the terms of the original agreements. The latter aspect is arousing serious protest, but there are other areas which also deserve attention. The entire picture is very confused, which seems to be deliberate. There were two main types of investments made in this situation – firstly, the basic and traditional insurance products such as pensions; life, health and general insurance and secondly, the depositor who was seeking high returns. It is true that the pension products offered an optimistic 12% rate of return, but the short-term depositors were different. Much of the current discussion and argument is actually about the repayment of the depositors, not the traditional insurance policyholders. The fate of the policyholders is often invoked by people who are actually arguing for the return of their own deposits and that is why the separation between the two, which Dookeran makes, is so important. To quote – “…The number of traditional, long term policyholders affected by this crisis, covering pensions, life and health insurance, is around 225,000 persons and accounts for $6 billion in liabilities…” That is an average of $26,666 per policyholder. Again – “…There are approximately 25,000 customers holding these short term contracts, and the liability to this group is in the region of $12 billion…” That is an average of $480,000 per depositor. Ironically enough, the voice of the traditional policyholders, who outnumber the depositors nine-to-one, is virtually silent in all this. But then again, it is clear that by far the greater liability lies with the depositors and further, that they appear, on average at least, to be owed about 18 times more than the typical policyholder. Yes, I am aware that there are depositors who are also policyholders and so on. For those of us who did not invest with CLICO, the mere idea of our taxpayers’ funds being used to rescue those who placed high-return deposits is deeply offensive. Both the CL Financial chiefs and the depositors who took the chance at investing at those incredible rates of return are being spared the consequences of their decisions by the bailout process. But those groups are being differently treated from each other and that is the point in this commentary. On the principle, the absence of consequence is inimical to any development, personal or national. When I consider the appeals from Credit Union and Trade Union leaders, as well as individual investors, it makes me wonder if there is a live concept of responsibility in this place. All those people withdrew money from the slow-but-steady accounts of the traditional banks and put it into the high-interest accounts at CL Financial and HCU were indulging in riskier choices. How can they be so bold-faced as to tax the rest of us for their adventure? There are now two groups organized to lobby for the interest of the disappointed depositors – the ‘CLICO EFPA Policyholders’ and the ‘CLICO Depositors Interest Group.’ Some of the leading members are themselves leading CLICO sales agents, so the decline continues. They are asking for an urgent meeting with the Minister of Finance and litigation is threatened, so this will form part of this ongoing series. Note – The data in this table is taken from the Guardian article cited, except for the Eastern Credit Union Asset Value which is from its 2009 Annual Report. The CUL has not made any convincing case for a possible collapse and it seems reckless to even suggest further collapses on the basis of these figures. But the confusion is continuing, with contradictory positions being taken on this issue. The idea that the Credit Union movement is under threat is a very serious one, which would be of great public concern, so we need to examine these statements carefully. At page 10 of the Express of 22nd September ‘Credit Unions seek help from Rowley’ – see http://www.trinidadexpress.com/business/Credit_unions_seek_help_from_Rowley-103498744.html?corder=reverse – the Credit Union League met with the Opposition Leader, Dr. Keith Rowley. Once again, the idea that Credit Unions are in serious trouble was advanced – “…They said they would not be able to sustain daily operations. …” That is a very startling statement, this time given without any attempt to provide evidence. To add to the confusion, the Guardian of that same day (22nd September) reported, at page 13 “CFF welcomes move to meet with CU on Clico” – see http://guardian.co.tt/news/general/2010/09/22/cff-welcomes-move-meet-cu-clico – on statements by Esme Raphael, President of the credit union’s Central Finance Facility (CFF) on this situation – “…Raphael said while the credit union movement was under no threat of collapse, the 20-year repayment plan would make it less competitive in delivering credit union services…”. These contradictory messages will detract from the credibility of the Credit Union movement and must be clarified. The idea that there is any such thing as a ‘guaranteed investment’ is preposterous. An absolute oxymoron is generating all this argument. Yes, the last government made certain pledges and I have been critical of those, but here we are entering an even more turbid situation. As outlined above, the PP government has decided to alter the terms of the existing bailout agreement as to refunds to depositors, so it is clear that it regards the terms of those agreements to be negotiable. In my view, the most odious aspect of the entire bailout is that the wealthiest individual in the Caribbean was able to negotiate the largest-ever loan from our Treasury at zero interest on the basis of a letter. If the terms of the bailout agreement are negotiable, why are we not insisting on charging a proper rate of interest to compensate the State for these massive loans? Who is protecting our country’s wealth? In view of the fact that they are essentially unsecured loans, the only proper interest rate would be a punitive one. There are live, cogent notions of financial equity and economic justice which are being abused in this entire scenario, but that is for a separate series. The amounts involved are massive – “…The total funding provided as at May 2010 by the Government and the Central Bank, excluding indemnities and guarantees to First Citizens Bank amounted to approximately $7.3 billion…” Emphasis in the original. That equates to over $456M a month to rescue Mr. Duprey. I wonder how much is the total of the indemnities and guarantees? The bailout terms were revised to reduce the amount of the State payout to the depositors, but no additional pressure is being put on the CL Financial group in terms of interest payments. It is resembling a comfortable arrangement for Duprey. Another aspect of the budget which was difficult to follow was the shifting focus between CLICO and CL Financial. The proposal to merge and prepare CLICO and BAICO for divestment needs a fuller explanation. That is because the leading insurance ratings agency, AM Best, just de-listed CLICO, due to its failure to provide financial data – see http://insurance-technology.tmcnet.com/news/2010/09/14/5004871.htm. In addition, BAICO was declared insolvent in November 2009 – see https://afraraymond.files.wordpress.com/2009/11/baico_resolution_strategy.pdf – and filed for bankruptcy in the Florida courts in March – see http://www.thevoiceslu.com/local_news/2010/march/02_03_10/British_American_Files_for_Bankruptcy.htm. To quote Dookeran – “…As of June 2010, CLICO and British American combined total liabilities were approximately $23.8 billion but total assets were $16.6 billion…” Emphasis his. That is an insolvency of the order of $7.2Bn and it is not at all clear how, if at all, that can be divested. We need a better quality of information to move ahead with this, so it was encouraging to hear Dookeran’s clear post-budget statement “…No more shall we have secret government,…” – see http://www.newsday.co.tt/news/0,127330.html. 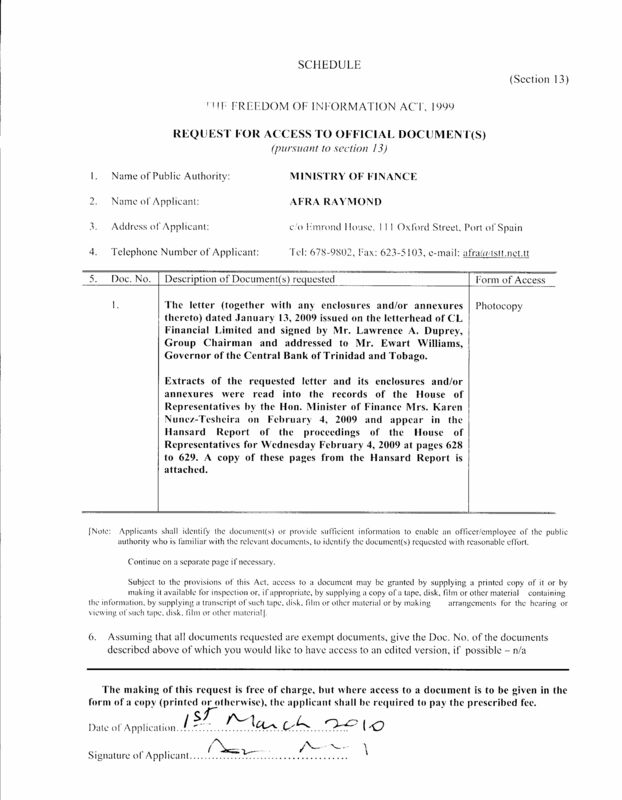 The original Duprey letter of 13th January 2009 – I have applied twice under the Freedom of Information Act for this and the second application has been in your Ministry since 28th June, unacknowledged. The audited accounts of the CL Financial group for the year ending 31st December 2008 – Have PwC completed that? When are they to be published? The Lindquist Report – Bob Lindquist was reportedly appointed to examine CLICO. Has he submitted a report? Are we to be told of any of his findings? The Central Bank’s winding-up petition for CIB in the High Court has given us a disturbing insight into the operations of ‘The House on the Corner’. When are we going to get reports into the collapses at CMMB, British-American or CLICO? Given that we are being asked to bailout and clean-up Mr. Duprey’s crisis, I feel we need to be told who are the borrowers of the $1.0Bn of ‘non-performing loans’ in CIB’s portfolio. The fact is that these are some of the delinquents we are being asked to bailout and the names would surprise the public. Local banks customarily publish the names etc of people who have non-performing loans, so why can you not do the same thing in this case? To quote the budget statement – “…This crisis was caused by…wrong financial reporting…” False Accounting is a criminal offence under our laws – When are criminal charges to be laid? Those people – the accountants who were accused of that grave offence – belong to professional bodies, both here and overseas. Is there any intention to make formal reports to these professional bodies? Quoting again – “…This fiasco was caused by reckless corporate governance and the glaring failure of our financial regulatory institutions…” What action is to be taken against these slack regulators? Is there any intention to invoke the ‘Fit and Proper’ provisions against any of the CL Financial Directors or Officers? Finally, do you intend to insert an interest clause into the ‘sweetheart bailout agreement’? Mr. Dookeran, you have the opportunity to inject notions of solid responsibility and proper conduct into this sorry situation. Next, I am going to delve into the promise to ensure accountability of the responsible persons. We were told directly that this HCU collapse is not a risk at all to the system, but these disappointed savers are still to be rescued by the Treasury. This is a poor precedent, since when the next Financial Institution collapses, the then Minister of Finance would have to deal with those unrealistic expectations. 1. Is it your position that no bailout at all should have been considered? If so, I disagree. One of the few items with which i agreed with the PNM was that this presented a systemic threat to the economy. The unwinding of CL Financial is a multiyear engagement and the GORTT simply had to step in to provide a measure of liquidity and confidence to the system. I am in wholehearted agreement with you however that there has to be a haircut administered to the depositors which Dookeran is in effect doing with the 20 year note (probably a 25-40% haircut in present value terms). I presume that some institutions (e.g NIB?) may provide some measure of immediate liquidity at a steep discount to face. Whether because the hole was becoming simply too gargantuan to fill or he wanted to send a message or both, Dookeran is to be applauded. 2. HCU. I fully understand the moral hazard argument you make. However, Dookeran is quite right to say it is a matter of social equity. It was always amazing to me that T&T society was going to countenance full repayment to Clico depositors while throwing HCU investors to the wolves. Deeply unjust and untenable. It shows that we get sidetracked by race with class the much more salient concern. Presumably HCU didn’t have the gall to stage their demand to be bailed out in the posh surroundings of the Hilton. 3. Loan to Duprey. I share your disgust with the MOU that was negotiated and it should be renegotiated but frankly that ship has sailed substantively. Mr. Duprey is as much a player in this as i am. CL Financial is a corpse waiting to be picked over by vultures i.e the bankers, consultants, accountants etc. Technically it is a loan to CL/Duprey but in all but name it is a direct transfer of taxpayer funds offset by whatever proceeds from divestment. I fully agree with Lucie Smith in that regard it is well past time to bring in the financial undertakers to liquidate the group. 4. Auditors. In closing, I am fully supportive of your attempts to hold PWC accountable. This appears to be the grossest of negligence imaginable. Mr. Raymond, you seem to have fallen for Mr. Dookeran’s propaganda wrt the term “depositors”. The EFPA (what is being called a short term contract) is a deferred annuity and is definitely a long term contract. Please see http://banking.about.com/od/annuitiesinsurance/Annuities_Insurance_Products_in_Banks.htm for clearer information on annuities. The EFPA offered guaranteed interest rate periods from the inception of the policy with penalties should the policy be surrendered before the end of the guaranteed period. The contract is a standard annuity contract that some policyholders chose to surrender after the guaranteed interest period was up. the interest rates offered were not that much higher, if at all, than other institutions, but it was the only option where the money you put in was covered/guaranteed by the law. THAT is what made it attractive. The contract reads as a standard annuity not subject to tax benefits. The EFPA was covered by the statutory fund by law and the amount to cover liabilities to EFPA policyholders was included in the calculations for the Statutory Fund. Clico was not a mutual company and policyholders are not shareholders. The failure of the regulatory authorities in their oversight duties puts the liability on the State. The statutory funds have precedence of claim over any assets pledged to them according to the Insurance Act of 1980. Should the CBTT dissolve Clico, then it has the right to demand that the directors personally pay all or part of the deficit in the fund. Has the Minister separated Clico liabilities and statutory funds from BA’s? Every statement lumps it all together. Please take another look at the real picture and come again. I disagree, the EFPA were clearly fixed deposits dressed up as annuities, In your own description, you state that … “the contract is a standard annuity contract that some policyholders chose to surrender after the guaranteed interest period was up” An annuity is a long term contract with extremely onerous penalties if broken before maturity. The option of an investor to break a long term contract in the short term without penalty makes it a short term contract. i.e a fixed deposit type instrument. However, the fundamental question remains who are to fund these losses? Is the investor to accept no responsibility or should the people who had the good sense to stay away from CLICO (about whom serious concerns were mooted for the past two decades) have their taxes diverted to make these people whole. “An annuity is a long term contract with extremely onerous penalties if broken before maturity”… Really? First of all, did you actually check that link in my comment or look at any other definitions or descriptions? If you don’t like the link I had posted before, please try this one http://www.pensionsadvisoryservice.org.uk/personal–stakeholder-pensions/annuities. A deferred annuity does not “mature”, the amount in your policy account is converted to an annuity (like any pension plan) at the date you choose to retire. The later you do so, the more money you’re likely to have for that annuity. Different conditions in each policy would put emphasis on different types of benefits. There is no obligation to buy that annuity with the same company (it is a bit different for those deferred annuities that attract tax breaks), you can take your CSV (the amount in your policy account) and buy that annuity elsewhere or invest it as you please to provide the income that best suits you. Regardless of whether it is a single premium or a monthly, quarterly or annually paid premium, the basic contract remains the same. Surely you or someone you know has purchased a deferred annuity for the tax benefits (that is what is emphasised in the sale) and then surrendered it a few years later. Because of the tax not paid (whether you claimed for it or not), the surrender has to go through the BIR and they will take 25% of the amount in the policy account, and the policy holder gets the rest. If the policy did not qualify for the tax break, then the surrender is just processed by the Insurance Company and the policyholder gets all of it. Most of those policies have a penalty if you surrender within a year or two of purchase. The EFPA is no different. I usually read Afra Raymond’s articles and find his positions well thought out. I was therefore appalled to see so many misconceptions fueling his stance in this article. I hope that both you and Afra will look at the Insurance Act 1980(http://rgd.legalaffairs.gov.tt/Laws2/Alphabetical_List/lawspdfs/84.01.pdf), the purpose of which was to protect the policyholder and encourage confidence in insurance policies and annuities. There is a procedure outlined there for the PROTECTION of said policyholders that has not been followed. Why? Instead of attacking policyholders (who are not investment bankers or financial consultants, nor generally hobnob with such), reconsider where the responsibility lies. I am maintaining my position that the EFPA is a deposit which happens to be called an annuity and further, that the CLICO ‘Policyholders’ Group is making use of this misnomer to promote its interests, to the detriment of the country and its silent majority. Yes, I am speaking of those of us who did not partake in the CLICO offers, yet are now being asked to pay some $12Bn. It is an enormous sum of money and the silence of the real policyholders, together with the corrupt terms of the original agreement – the one the CLICO ‘Policyholders’ Group is seeking to have upheld – are my driving force in this matter. It does not matter that I am standing, seemingly alone, at this point – the Truth has an awesome power all of its own, something of which students of history are all aware. It would be interesting to see if any genuine, traditional policyholders – people with life, health or pension products – raise their voices in your campaign. I must add, that although significant sums were provided by the last Govt towards a “CLICO” bailout, rather than address the deficit in the statutory funds (which is where the law would point to liability for the State) the majority of those funds had to have gone to paying off CIB DEPOSITORS who were not covered by the same guarantees of a statutory fund. You and me, knew that the real cost of the bailout was about what Winston is proposing at minimum. What is clear to me is that many of the people lobbying do not understand the financial system or positive economics or … simple maths. Change is not easy. There is the whole Kubler Ross… Denial,.. Anger,… Depression. All of which I am seeing. Not to mention Dooks being vilified, which is uncalled for. The economist side of my brain says the solution is ballpark and 0% interest is an absolute necessity in any payout cash flow. You aren’t alone… the rest of us just happen to have been too close to the bastards and need to keep silent until the matter is resolved. One of the Emperor’s minister.